The sun was shining brightly, its beautiful rays reflecting off of the shimmering water, where Rayla, having taken up the new name of Iizus, now resides. It was roughly fifty degrees out, too warm in the reptilian's opinion. She didn't like this heat, so she was resting under the shade of a great pine tree, her feet resting gingerly in the water. Thirsty, she reached down, pulling out a flask, and filling it up, the river water doing its job, and over flowing it with rich, mineral filled water. She would then raise the flask to her lips, drinking gingerly. Once she had cooled off, she let out a sigh, and looked out over the water. The river was quite wide, being about ten meters across. Smaller than some rivers she'd seen, but pretty big for the rivers around here. But now Rayla was beginning to miss flight. She missed her dragon form, of which she hadn't transformed into in nearly three years, having lived off the land in her reptilian and human form. So maybe, just maybe, it wouldn't hurt to let loose a little bit? There were no dragons around, at least none that would recgonize her. Standing up, the reptilian let out a breath. 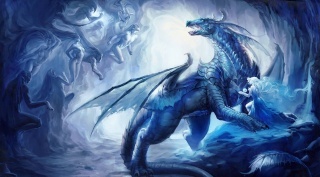 Her body would begin to glow brightly, quickly morphing into the shape of a dragon. She was concealed by trees, so no one would see. Once she was in her dragon form, she shook her limbs out a little bit. She wasn't used to this. With a test flap of her wings, the dragoness would look to the sky, examining it for any other dragons. Being quite small for a Seawing and an Icewing, she hoped her size would make it hard for any patrolling Icewings to spot her. After all, she was deep into rogue territory, far away from Icewing lands. No one would see her.... right? Kyuurei was wandering far away from his home again. Yeah he wasn't supposed to leave the Icewing territory for that long AND without permission, but exploring the rouge lands was still the best boredom curer for him. Kyuurei decided that he will take a drink from the nearby river before heading back home first, and so he did. He headed over to the river flowing with luscious water. While unaware of his surroundings, he took a sip from the river and he made a face when something is too sweet, he hadn't drank anything this sweet in forever. Might as well to drink some more. As Rayla would stretch out her wings, wondering quietly what the new day had in store for her, a gust of wind would blow by. She shook her head, the wind carrying with it tiny snowflakes. At first, the Ice Dragoness took no notice of these odd little details, and lifted her wings, ready to lift off into the air, her majestic body soaring through the sky. With a woosh of cold air, that was strong enough to shake the trees around her, and freeze some of the water that was closest to where she took off, Rayla would launch herself into the air. Her majesty would ride on the wind currents, which would lift her up, carrying her through the crystal clear skies. Soaring over the crystal clear waters, she would spin, her wings splashing against the water, before steadying herself, and diving, running her paws through the water. Raising her body up, she would blast off into the sky again, trailing up a spike of water, which would then freeze, falling to the ground, and rattling by a large boulder. In fact, Rayla missed being able to do this so much, she couldn't help but holler with laughter. Oh, how she'd missed being able to feel that breeze in her scales! As a confined little reptilian, she was barely allowed to stretch her wings like this. Letting out a breath of icy relief, after flying around, doing flips and spins, Rayla would make a landing on a nearby tree, stretching her talons out to grasp the bark. It bent a slightly under her weight at first, causing her to beat her wings a little to steady herself. The tree would gain a slightly layer of frost, mainly from Rayla's enthusiasm. “Ah, I needed that,” the dragoness would say with a chuckle, glancing up at the sky, her wings spread out. If only she could do that more often! So exhilarating! But alas, she had sworn she would keep her form until she felt comfortable in coming out again. Kyuurei was going to call it a day and head back to Icewing territory but... Something didn't feel right for him to leave yet, something about this dragon. Kyuurei sort of have the feeling to find him/her, but his other feeling about this tells him that was a bad idea to fly towards a stranger like him/her. But this feeling was gone when Kyuurei was convinced that the dragon he had sighted was an (used to be) Icewing, like him kind of. So Kyuurei took flight to the sky. He usually don't fly often as he hadn't practiced it enough and he had gotten a lot of injures just from flying. It doesn't help if his wings are made of easily broken but recoverable feathers, especially when he is flying at a high altitude... Not really fun for him right? As he was still flying, he saw a trail of ice on the ground, it was rather out of place which make Kyuurei thought that this was left by an Icewing and so it may be around here. Kyuurei decided to land onto the field of white, soft snow. Unfortunately, his landing was a bit clumsy, he crashed into the snow and now he has a pile of snow on his head, body and tail. Kyuurei got up and shook the snow of his fur, hoping that no one saw him landed like that. A swift breeze would blow through the forested area. Something was not right. The winds had recently shifted, and now a strange, new scent had rose up on the wind. An unfamiliar dragon, perhaps? Of course, as she began to tense up, ready to transform back into her dragon form, she had already spotted something that interested her. The tree shook ever so slightly as she tried to position herself to get a better look, spotting a sudden flurry of movement in the distance. It was brief, but it was clear enough to tell her what it was, and the scent even more so. Definitely an ice dragon, judging by the color of those scales. Oddly enough, despite the temperature, there was still snow on the ground. This, of course, as well, peaked Rayla's curiosity. If there was a creature that was powerful enough to leave such a trail, even in fifty degree weather, then of course she would like to see who it was she was chasing after. Gliding through the open air, Rayla would fly towards the other side of the river, where she had smelled and seen the creature. Maybe it was stalking her? That would make her quite angry. If it had seen her reptilian form, well…. Then drastic measures would need to be taken. But she wanted to remain hidden. Which was pretty hard when you were a thirty foot tall, blue and white dragoness. But, she managed to swoop down to the other side of the river bed relatively silent, quickly running towards some trees, and slinking behind them. Her wings would tuck against her side, and she would try to stay out of sight, hiding behind the pine trees. It wasn't long before the dragoness felt the chill of snow. A unique feeling, especially in this weather. Cautiously, she poke her head through some branches, looking through to see if there was any threat. But she kept herself ready, in case an attack ensued. Due to the fact that Kyuurei has left the site, I will be voiding and locking this topic.